My husband and I came to the decision to enroll our daughter in Yinghua Academy’s Chinese Immersion education program gradually, over a period of about a year. As we began to think of the kindergarten options for Grace, we realized that we wanted something beyond the basic public school kindergarten experience for her, and we explored magnet programs and others. Initially, both of us were intrigued and excited by immersion education, my husband more so than I. He believed that this would be a great opportunity for Grace and encouraged me to give it more thought. Although I found immersion education to be an interesting model, I was concerned that somehow it would delay the children’s grasp of basic concepts, and I had my doubts about the viability and accountability of a charter school. 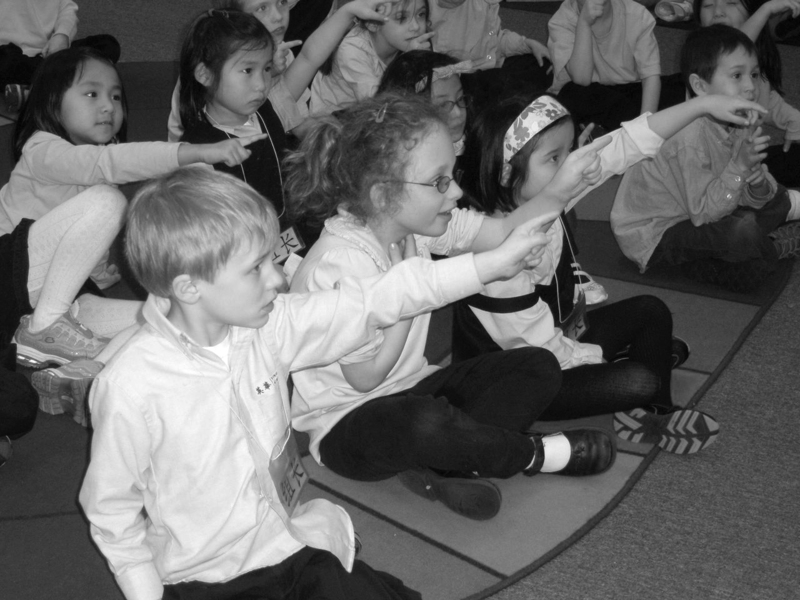 Grace, the author’s daughter, center, and her classmates learn about Chinese characters from their kindergarten teacher. In the next several months, I began to read more about immersion education and ask questions of university faculty, families who had children enrolled in immersion programs, and also people working with charter schools and the state’s Chinese language initiative at the Minnesota Department of Education. I questioned anyone who was patient enough to answer my many questions about immersion education, charter schools and Yinghua Academy in particular. We visited Yinghua Academy on several occasions. We were greatly surprised by our daughter’s engagement in the activities and were encouraged by her interest in the school. On one visit, she observed a classroom of older children playing a “Simon Says” type of game in Chinese. When the teacher asked who wanted to be the leader for the next round, Grace stepped forward without really understanding what was being asked of her. Her comfort level in the classroom and the extra time the teacher took to make sure all the students were engaged were very important to us. Although we knew that Grace could study a foreign language at any point in her life, we felt we only had one opportunity to give her an immersion education experience, a solid base in a foreign language that will shape her world view and challenge her to think differently than her peers. The first week of school was thrilling for Grace. She was at a new school with a new teacher and many new classmates. She was very excited to become a kindergartener and be in a “big” school. She was so busy with the new experience; I don’t know that she fully understood the emphasis on learning through Chinese. As the early weeks progressed, she enjoyed learning the school songs, singing the first word or two and then mumbling through the rest of the song. She easily learned to count numbers from one to ten out loud and was already doing her weekly numbers homework in Chinese. Yet she would often come home from school exhausted and frustrated by her long day. The teacher was so focused on the academic content that many of the students didn’t feel that they had made any friends. The principal then conducted a few short units on making friends for the class to help break the ice. Toward the end of the first month, Grace’s frustration with learning the new language and the constant drive to understand what was being said to her began to take its toll. She expressed that she did not want to go to school anymore and did not look forward to her day. Grace often visited the principal’s office to discuss issues she was having with other students. At first we thought perhaps she was experiencing behavioral problems, but we realized that her acting out was brought on by her general frustration with the classroom. Limited to speaking only Chinese, the teacher was not able to help her resolve her problems in the classroom and she was then referred to the principal’s office to chat in English. It should not have been surprising that Grace’s first words in Chinese beyond numbers and songs were Bu Keyi or “Not appropriate/possible.” It was a difficult time for all of us. After the adjustment into the new schedule and working through some of her social frustration Grace settled down to a routine. She did not speak much Chinese at home or to others outside of the school. She did say occasional words but they seemed random. From the beginning, Grace shared what she learned at school with her younger sister by teaching her to sing the songs. At end of the first two months she was able to recite a Tang Dynasty Poem about swans and began to say specific words over and over again. She was fond of saying lajitong (trash can) again and again. She told her dad that the Chinese word for hat was maozi. She also told us that in her classroom if one wanted a drink of water or to use the restroom, one must ask the teacher “keyi bu keyi he shui or keyi be keyi (qu) xishou jian.” Grace missed verbs or key words in the sentences when she said them, but understood when her teacher said them. In November it was clear that Grace now understood much of what her teacher was saying to her. She concluded a unit on the family and was able to name her family members and describe members of the family that she doesn’t have, like a “brother”. When we met with the teachers for parent conferences, we learned that Grace’s academic progress was satisfactory and the teachers felt that she was learning Chinese and other subjects well. We expressed some concerns about Grace’s inattention in the classroom and in other activities, and the teacher pledged to work on engaging her more in the classroom. At the end of December the teacher shifted from speaking about concrete things to more relational concepts. Grace’s understanding of the language around these concepts was very clear. She had begun to learn the basic strokes for writing Chinese characters. She copied the teacher’s writing and wrote the words for “winter” on a drawing without instruction; she did it very well. Chinese New Year was celebrated in a big way at Yinghua Academy, and Grace prepared every day for the school performance. She practiced singing the Chinese New Year songs in the car to and from school each day. On the day of the performance, I learned that she was not only singing the songs that her class performed, but she was also singing some of the songs that the other classes performed. She was extremely proud of the decorations that her class had made to celebrate Chinese New Year. As we are now winding down to the last three months of this first year, we can see that Grace is beginning to master the Chinese of kindergarten. Her teacher has said that she no longer employs visual aids to help the children understand and that she can usually simply talk to them, and they follow what she says. She is giving incentive points to the children to speak Chinese to each other and in the classroom, and we hear Grace use more Chinese phrases at home. Grace has begun to quiz me during the car ride home from school each day. She says the Chinese word and waits for me to say the meaning in English. So far I have done well on my Chinese language quizzes, but I can see a day where she will surpass me. Just last week, I realized that Grace does not have a very complete understanding of the days of the week in English. She can recite Sunday through Saturday but is unable to tell you what day it is today and what day tomorrow might be. However, her understanding and communication of these concepts in Chinese is perfect. She accurately names the day, yesterday’s day and tomorrow’s day. It has seemed that for the other subjects that she has covered in school thus far, Grace understands the concepts both equally well in English and Chinese. It is interesting to find her ability in Chinese superior to that of English on this topic. Over the last eight months, we have seen a tremendous change in Grace and she is confident and engaged in her academic and social interactions at school. The trauma of the adjustment during the fall has completely been overcome. Moreover, her understanding of and ability to use Chinese is amazing. She is thriving and we look forward to seeing what first grade at Yinghua Academy brings.